Discover a wealth-building secret so POWERFUL that many people who learned it became millionaires within a year! Baffled multimillionaire Dolf de Roos wondered, "Why aren't people getting rich - when I've made it SO EASY for them to emulate what I did to get wealthy?" Become a MAGNET for RICHES! And you can create more wealth than you know how to spend - even in today's economy! What is this secret? Read on! It's reaching a point at which you have so much money that if you were to spot a deal, invest a million dollars into it, and for whatever reason, the deal goes sour, it wouldn't hurt your lifestyle at all. You would simply shrug it off and say, "Hey, better luck next time." If that excites you ... then, this email has reached the right person. Because the secret I share with you has the potential to make you fabulously wealthy. And, it can help you reach that phenomenal level of richness without sacrificing a thing. If you want to have it all ... riches, happy relationships, hobbies you love, and the time to enjoy all of them, you will enjoy the secret I share with you. It's also going to help you push past anything that's held you back before ... and attract an abundance of money, happiness, fulfillment - regardless of which career or business path you pursue. 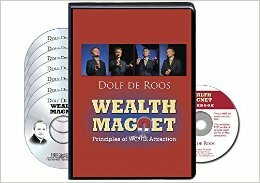 I'm Dolf de Roos, a multimillionaire who has reached the point of being financially free. Unlike so many people who wake up dreading the day before them, I wake up and wonder, "What will I do today?" There is great freedom and joy in that. It wasn't always that way though. I was born into a middle-class family and, perhaps like you, I was told to get a degree and a real job. So as a younger man, I studied electrical engineering at the University of Canterbury. However, an interesting thing happened. During my first week at engineering school, I looked around at the people with the degrees - the lecturers, the tutors, the professors - and I thought, "These people aren't rich. They're wearing modest clothes, they drive around in old clunkers, and they have humble homes." It dawned on me that maybe getting a degree wasn't the answer to building wealth. What if there was another way? I completed eight years at the university, and I ended up with a little piece of paper that said, "Ph.D." I went to two job interviews. At the end of the second interview, I was offered a job at $32,000 a year. Back then, that was a handsome salary. However, the week before I had just completed a real estate deal that netted me $35,000. I remember thinking to myself, "Why would anyone in his or her right mind work 40 hours a week for 50 weeks of the year, turning up every morning at 8:00 a.m. saying, ‘Hi, boss. Here I am. What do you want me to do today?' for a lousy $32,000 a year? When, in one week, you could make $35,000 and take the rest of the year off, or do it again, or do whatever you like?" I didn't get it. So I didn't take that job, and to this day, I've never had a job. Instead, I pursued real estate and have made my fortune that way. Now, perhaps you've wondered why some people always struggle for money - even if they're hardworking and dedicated - while others seem to have no trouble at all attracting money and opportunities. I started to wonder about this myself. I thought to myself, "I wonder if my message is getting through?" After all, I had given people everything I used to build my fortune, through my books, audio programs, conferences, and more. Surely, if they had the tools for succeeding, they could do it. I was quite meticulous about keeping a database of people who had attended my events or bought my products, so I ran a survey. My goal was to find out how many of my students had become millionaires. How many within 12 or 18 or 24 months had made a million or two for themselves by following all of my advice? When the results came in, I was devastated. Only 5 percent of my students ever made it. I was crushed. I thought, "You know, maybe it's my New Zealand accent." "Maybe I speak too fast." "Maybe my information is too simple or complex." It took me 11 months to uncover the answer, but what I discovered was like a catalyst. It could take someone who has had a lifetime of lack and transform that person into a magnet for wealth. Rich people don't necessarily do things differently. But they do think differently. They have a different mindset. They look at the world differently. They look at how to make money differently. They look at how to spend it differently. That's why they get different outcomes. In other words - it has everything to do with psychology. Many people that I taught this discovery to became millionaires within a year or two! Armed with this discovery, I started incorporating the psychology of the wealthy into my real estate teachings. Their ability to make a million within a year or two went from 5 percent to more than 80 percent! But, here's the amazing thing ... you don't have to use real estate as your vehicle for getting wealthy. If you absorb the philosophies that I uncovered during my 11-month study, you too can become fabulously wealthy in any endeavor that takes your fancy. I've partnered with Nightingale-Conant to share this psychology with you in my program Wealth Magnet: Principles of Wealth Attraction. Today, you can own this program for $50 OFF its retail price! You DESERVE to have it all ... and it can be easy! Let me show you how Wealth Magnet can help you adopt the psychology of the wealthy so you can create more wealth than you know how to spend. Keep in mind, these are not theories; these are proven truths that I uncovered from the result of my 11-month study. Truths I have used in my own life to become fabulously wealthy. Truths that my real estate students have used to go from a success rate of only 5 percent - to more than 80 percent! The new formula for getting rich (rapid response + risk = results)! I'll cover everything with you - from what rich people think about work/life balance ... economic conditions and world events ... lifestyle ... running a business ... career success ... parenting, and more ... so you know how to handle every life situation like a fabulously wealthy person. And in so doing, you'll soon find yourself attracting more money, more opportunities, and more time for your family than you ever dreamed was possible. It's truly as simple as adopting the psychology of the mega-rich! Prosperity can be yours when you master the psychology of the super-wealthy! Now you can get the tools you need so that you can replicate this psychology and achieve wealth beyond your wildest dreams, in Wealth Magnet. Where you are today, who you are, the financial circumstances you find yourself in, are all a direct consequence of your previous decisions. Do you want to continue going down the same road you're on now? Do you want to continue struggling for money? I sure hope not. Especially when amassing a fortune can be SO EASY when you adopt the psychology of the super-wealthy. And, especially when Nightingale-Conant has made it SO EASY for you to get in on this. The choice, however, is in your hands. I just hope you decide to follow the path of the super-wealthy. PS: When you have more wealth than you can possibly spend, money worries vanish. You can go on vacation without even asking your travel agent how much it will cost. You can fall asleep at night wondering what opportunity will bring you even more wealth - just for fun. You'll find yourself so much more relaxed, enjoying a quiet confidence. Money is not an object. If you'd love to be in that place, Wealth Magnet is what you've been searching for. "Dear Dolf, I bought your books. I bought your tapes. I bought your seminars. I've made millions because of you. Thanks. I listen, I learn, I do!" "Your system has opened our eyes to possibilities we have never considered as we begin to realize dreams we once thought were only dreams. Thanks to your system, we now know that we haven't been dreaming big enough!" - Consetta P. and Craig K.
He's on his way to financial FREEDOM! "You have opened up my whole new future! Financial Freedom here I come." This new thinking changed the direction of her life! "I greatly appreciate your time and the valuable information that Dolf has bestowed upon me. This new thinking has changed the direction of my life. Thank you." YES! I'm ready to prove I can become wealthy even in today's economy! I'm ready to become a magnet for prosperity by adopting the psychology of the MEGA-RICH! If this program does not live up to my expectations and I don't find myself attracting money and opportunities, I will simply return the program within 30 days for a full refund. No questions asked.